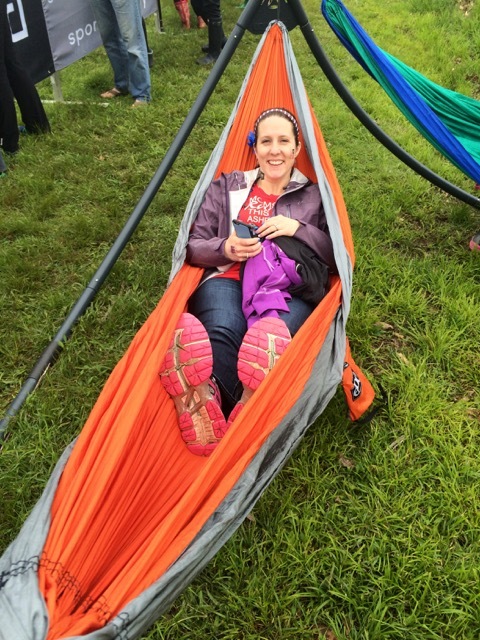 Last weekend marked my fourth Ragnar Relay, Ragnar Trail Richmond. After several years of turning down my friend, Chuck, when invited to join his team, I finally drank the Ragnar Kool-Aid and ran Ragnar DC in 2014 with my Cruiser friends – Chuck included. Having had a fabulous time, I eagerly joined our MRTT team to run Ragnar Trail Appalachians WV last spring and Ragnar DC last fall. Shortly after Ragnar DC last fall, my MRTT friends suggested we form an ultra team for the newly announced Ragnar Trail Richmond. 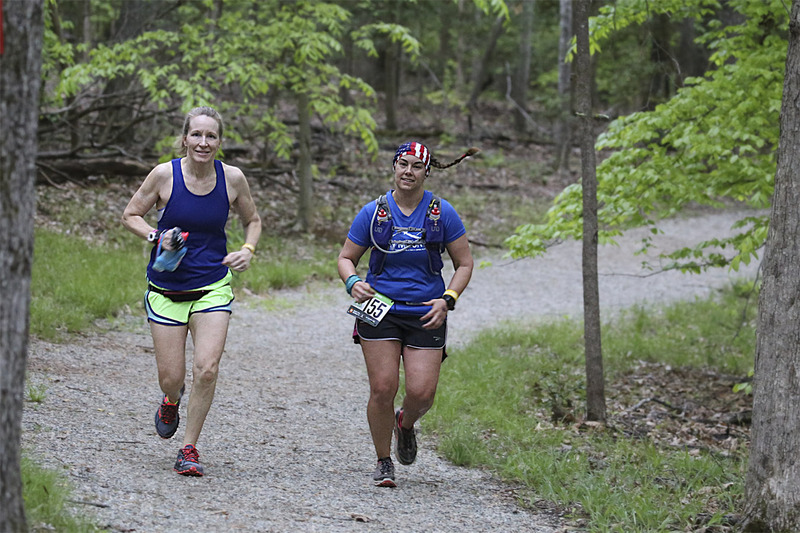 When I mentioned that a younger Deb would have jumped at the chance, my friend Amanda reminded me that I’d just run 30 miles on my combined legs at Ragnar DC and that I could easily handle the 31.4 miles required of the ultra runners for Richmond. I nervously signed up and prayed that my old spine injury wouldn’t complain too much. Before I knew it, race weekend was upon us, and Friday morning Bill and I hit the road for Richmond. Bill was going to stay with Meagan‘s husband Barry in their RV at a campsite nearby and be our unofficial photographer. 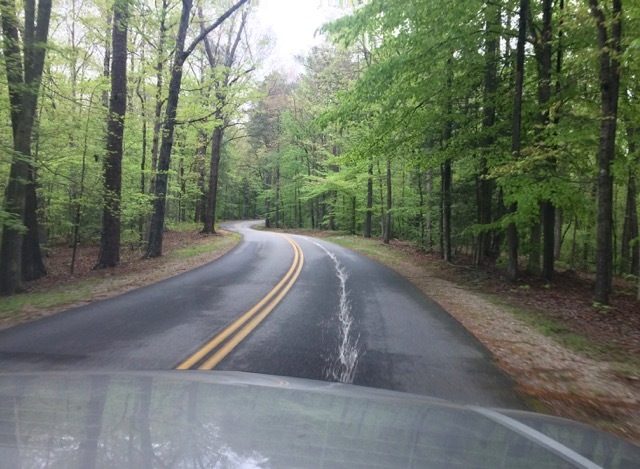 Driving into Pocahontas State Park, I started getting pretty excited about what was to come! Trees lining both sides of the road gave us a small taste of what a beautiful park we were visiting. 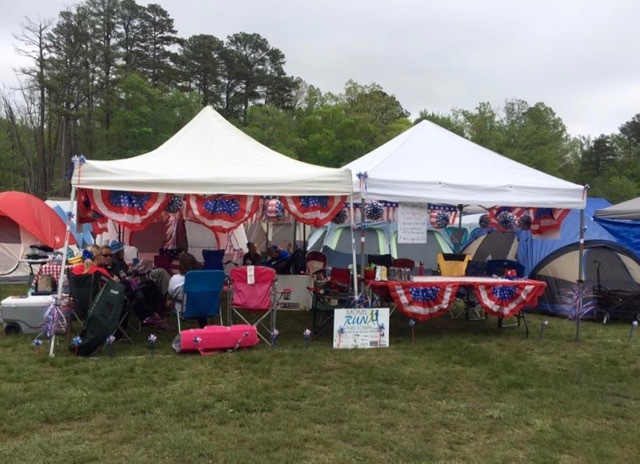 By the time Bill and I arrived, my teammates had set up the entire campsite, complete with patriotic decorations. With about three hours to kill until our first teams headed out, we had plenty of time to just relax with eager anticipation of our upcoming adventure. 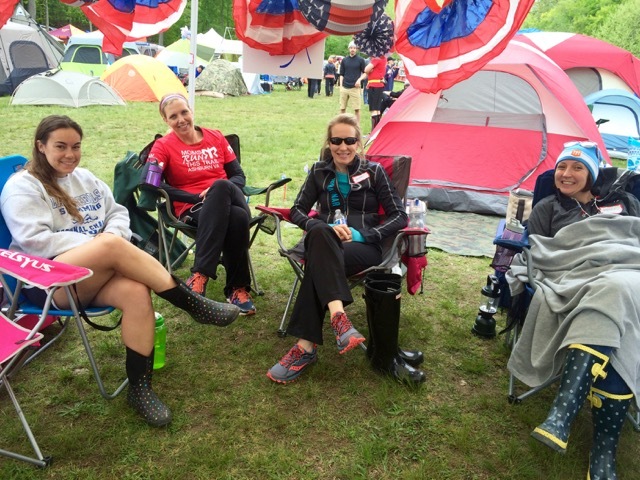 Our MRTT chapter had two regular teams and two ultra teams representing. 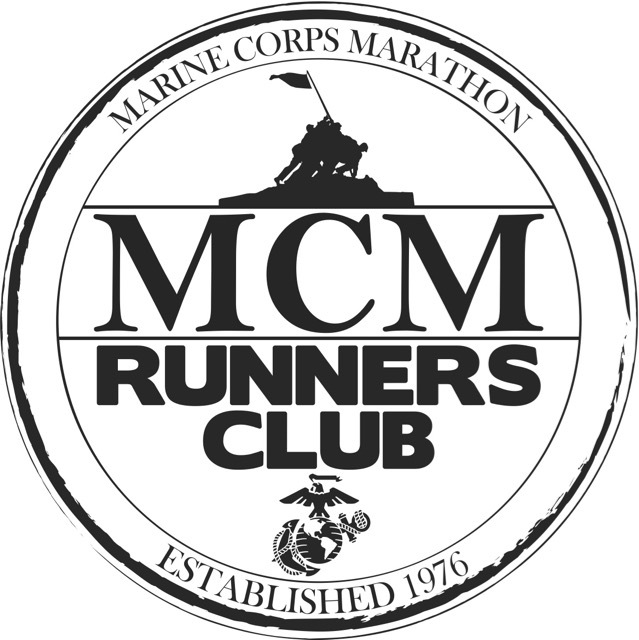 That’s a total of 24 running mamas (eight per regular team and four per ultra team). Some of us relaxed more than others; however, as chapter leader and my team captain, Amanda was allowed all the rest time she could find! Anticipating that we would forget to document our runs with pictures of us together (we have a habit of doing that), Meagan and I asked Bill to take our picture while we were waiting for our first runners to hit the trail. 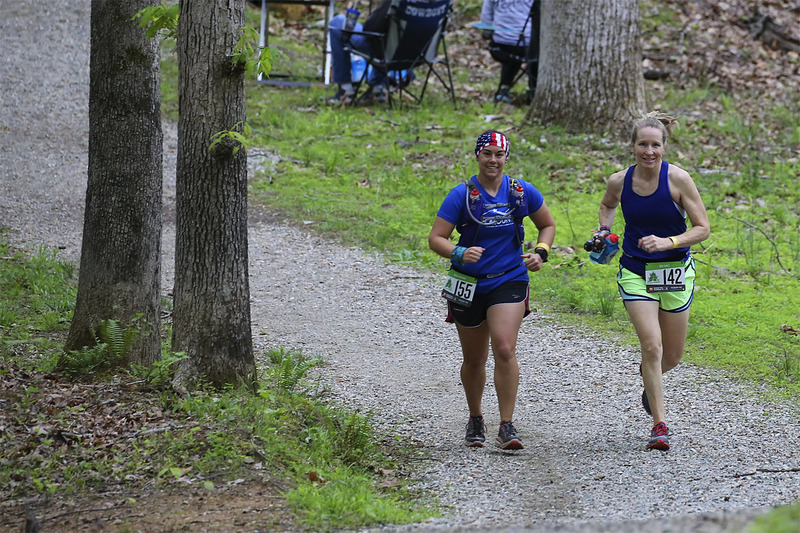 With two ultra teams, we were able to buddy up and Meagan and I chose to be running buddies as soon as we decided to join the team. That meant that we actually had to be on different teams so we could run each of our legs together. 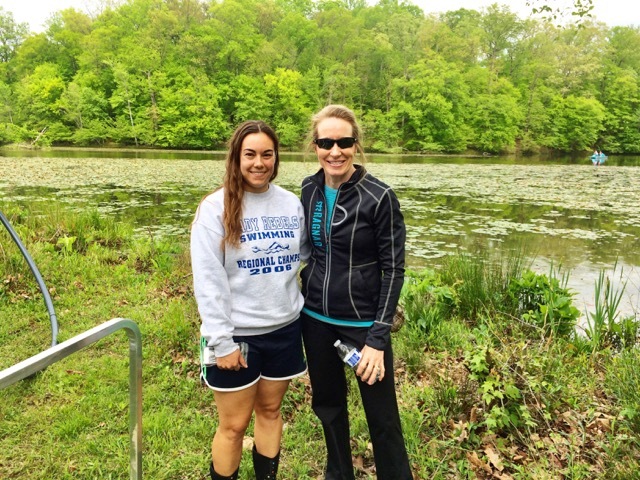 First out of the gate were Angela and Jenny, getting our Ragnar Trail Richmond adventure started! As ultra runners, we had the option of running our required loops one at a time, or doubling up and running them two at a time. We unanimously chose to double up so we’d have a longer down time between runs, and hopefully have time to get a little sleep. As Runners 3, Meagan and I ran the Yellow Loop (5.8 miles – intermediate), immediately followed by the Red Loop (5.5 miles – hardest) first – the two hardest and longest loops. Our 11.3 miles ended up being 12.4 miles according to our Garmins. Early into our run, we ran past Meagan’s family, including Scout and Hank (I’ll share pictures of them in a later recap). When I didn’t see Bill with them, I told Meagan to be prepared for him hiding behind a lens somewhere else along the course. About a half mile later we spied Bill just as he captured us starting our climb up a hill. Shortly before finishing the Yellow Loop, we saw Bill for the second time, again shooting from the top of a hill, forcing us to run strongly up the hill so we wouldn’t appear to be slackers! Notice that I’ve pushed my bib around to behind me. Meagan and I joked that when anyone passed us we needed to tell them that we were ultra runners requiring us to run slower to conserve our energy since we were running double miles. With that, I pushed my green bib to the back, so those orange bibbed runners could see it! We finished our first loop, and headed back out for the Red Loop just as darkness started to fall. 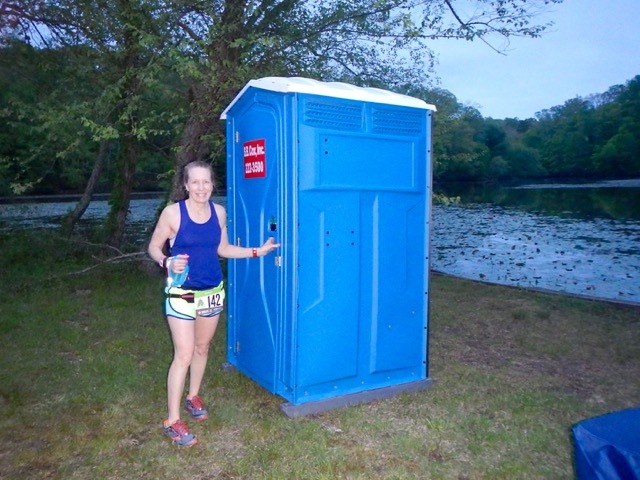 I had Meagan snap this picture of me at our very own porta potty, set up just for the ultra runners. While stopped, we refueled and I topped off my water bottle – not from the lake, but from water containers on the table out of the picture. 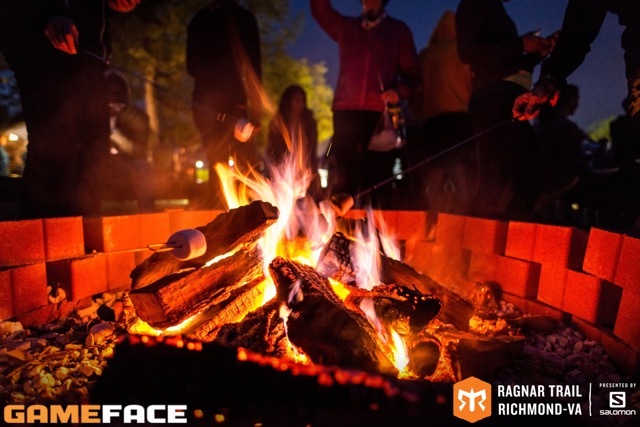 Meanwhile back at Ragnar Village during our run in the dark, runners who weren’t out on the trails were partying it up eating s’mores at the campfire! 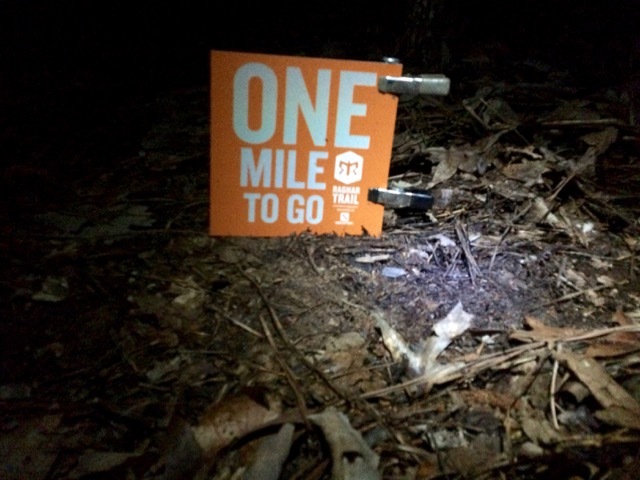 After a very uneventful red loop in the dark with no pictures from me except for this one of the glorious “one mile to go” sign, we headed back toward the exchange area to happily hand off our bibs to our teammates. 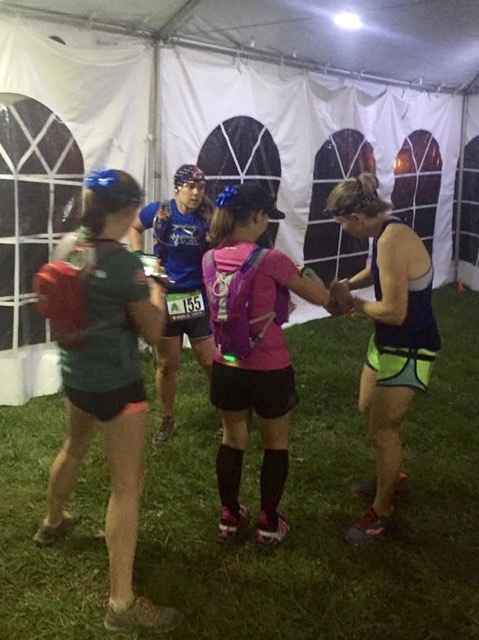 Amanda captured this picture of us handing off our bibs to Sarah and Ashley. At first, rather than handing Ashley my bib, I took off my SPIbelt and handed it to her! 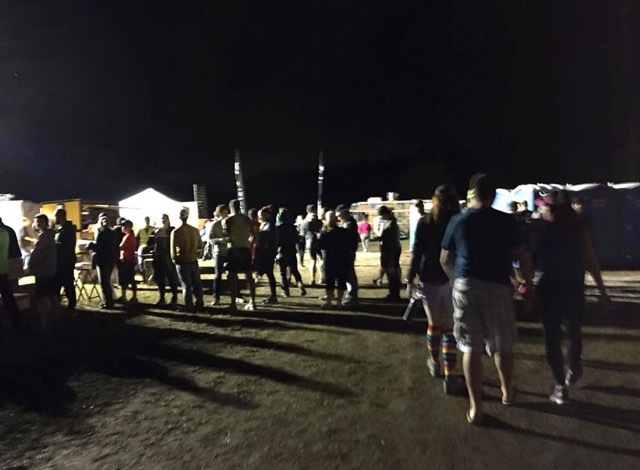 Ah, flashbacks of handing Meagan my watch instead of the slap bracelet in our 3 AM exchange in our first Ragnar DC! With only about fifteen minutes until our food tickets expired, Meagan and I headed straight to the food trucks to pick up our dinner. Most trucks were closing up or had run out of their most popular items so we happily settled for barbecue – chicken for me. Once back at our campsite, I scarfed down my 10 PM dinner, but Meagan didn’t have an appetite and couldn’t eat hers. Stay tuned on Thursday as I recap leg two where Meagan and I ran our first loop sleepy-eyed and in the dark, but enjoyed watching the forest come to life with the first light of sunrise as we headed into our second loop. Editor’s note: To read Part 2, click here. Which do you think you’d like better, a trail or a road relay? Did you race last weekend? I love how you all buddied up to run your legs! It seems like it always rains for these trail races. I love the regular Ragnar but I don’t know about those trails! The trails weren’t too terribly technical, as trails go. If you were to consider a Ragnar Trail, I’d definitely recommend it to a beginner trail runner over Ragnar Appalachians. You did a much better job of explaining things than I did! Funny that we used a lot of the same pictures in the same sequence. You also have a better handle on that weekend than I do. It all runs together for me. 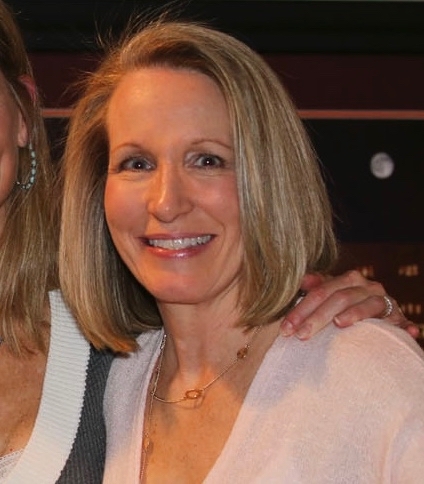 I know we saw our families throughout the event, .but I had a hard time pinpointing when and where. 🙂 There were also a few things I forgot or couldn’t remember the sequence of (like what we did immediately after running, etc I’m so glad we got to run together for the event, though. It was a blast! I had different “official” mileage than you from Ragnar. I used an elevation chart with the loop distances on it from before the event, which I had saved on my computer. But I noticed if you go to their webpage now, the loop distances match what you listed and are shorter than what they provided pre-race. Not sure what’s up with that. Don’t give me too much credit – I knew where we were on the Yellow Loop in those pictures only because Bill had them labeled Mile 1 and Mile 6! I also had to look at the timestamp on my own photos to get them in the right order, especially the two night runs. love this. i think i’d really like this particular relay race. can’t wait for part two! Courtney, I think you would love running a Ragnar Trail. I definitely enjoyed it more than relays stuck in a van even though those have their own type of fun and adventure. I’m trying to get myself a team for Ragnar Appalachia so I can get myself the Mudslinger medal after I run DC later this year. I’m a little intimidated since I’m a super novice when it comes to trail running. So I best get to practicing! I wish I could have a buddy. Oh fun! Hope you get your team together. I got the Mudslinger medal last year after running both of those races. I won’t qualify this year because Richmond Trail and DC aren’t teamed up. You both were looking good out there! I am glad you made it to the food trucks- you need fuel to run that much. How did Meagan hold up not eating! I slept in my car in the back seat the last time I tried to camp LOL I am not good about sleeping outdoors. My allergies are awful. I had plenty of food in my tent, so if the food trucks had been closed, I would have eaten one of my sandwiches. Meagan ate before our next run at zero dark thirty and I just complained about being hungry the whole run! I still want to do a Ragnar so bad! I think it would be great fun! Loved the pictures of you and Meagan! 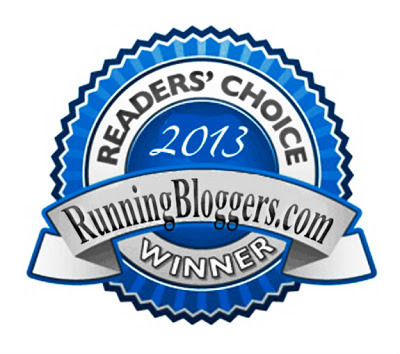 I think you’d love to run a Ragnar Relay or Trail, but from what I’ve learned about you from reading your blog, I think you’d like the trail version best. And thanks!